But because of Jamieâ€™s professed love for this underrated candy, I bought one shortly after her review. Now, kids might not like fruit in their candy, but as an adult (sorta), I found my tongue had grown accustomed to the flavor I had once disliked. I wasnâ€™t in love with Chunky, but felt the two of us had patched up a hole that had separated us for so many years. I also believed that would be the last of our meetings. Boy was I wrong. This past weekend, I popped into the Dollar Tree store to purchase some GooGoo Clusters. To my surprise, stationed right next to them was the new Dark Chunky. I was caught off-guard since I hadnâ€™t heard anything about this productâ€™s release. 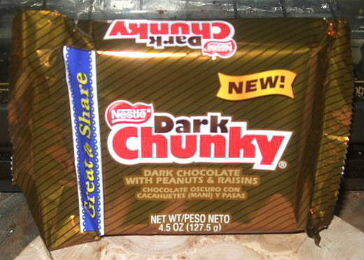 Though I felt Chunky was O.K., I wondered if dark chocolate was the missing element in the equation. Unwrapping the piece, my nose was greeted with a strong chocolate aroma, containing hints of coffee. It was so strong that my roommates, who were in another room, popped their heads into the kitchen and asked me if I had chocolate. Itâ€™s a good thing the Chunky Giant is so big that you can easily share it and still be satisfied. Breaking off a piece, I could see the trademark pieces of roasted peanuts and raisins embedded in the trapezoidal frame. The taste was… very, very, very rich. Had I not known it was a Chunky Bar, I would have guessed there was alcohol in it. Maybe there is a high concentration of chocolate liquor (the liquid you get from processing cacao beans – it’s not alcohol) or perhaps the dark chocolate is European bittersweet chocolate (bittersweet chocolate contains the highest chocolate liquor concentration, and European brands are traditionally around twice as high in concentration). 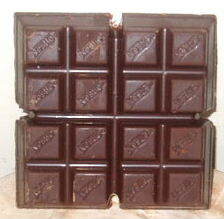 Despite the potency, the chocolate is still fresh and enjoyable – if you can handle such a behemoth of intensity. I will say that this is strictly a chocolate bar/block that has fruit and nuts in it as opposed to a fruit and nut chocolate bar. Whatâ€™s the difference? Well, Chunky (original) is the latter, as the whole thing is chock-full of raisins and peanuts. 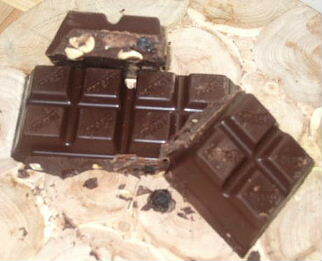 Dark Chunky only retains a fraction of the amount of raisins and peanuts, and both are relegated to the bottom of the bar. In the end, I actually prefer Dark Chunky to the original. What can I say? I am a sucker for dark chocolate over milk chocolate, no matter how overpowering the taste might be. Just be forewarned, lovers of the original – despite its striking resemblance to the milk chocolate variety, in taste it is a whole different candy. When I was a child, in the 1980s, Chunky had another variety besides milk chocolate and it was in a gold wrapper. It may have been dark chocolate, but I cannot remember. I do remember that I much preferred it to the original. I was delighted to find, the week before Christmas, these extra large gold wrapper Chunky bars in my local dollar store for, yep, only one dollar each! I bought one for every person on my Christmas list, and five for myself. I just finished the last of the five, and I will soon visit the dollar store with hopes of more, because they don’t sell them anywhere else in my small town. I still love the gold wrapper version the most! There’s a picture of the gold Chunky wrapper. It was a Pecan Chunky! I REALLY wanted to try these after I saw them on the Food Network but sadly they have already been discontinued by Nestle.